Avoid unwanted skin conditions by being well-informed about what acne ultimately does to the face and body. Acne is a common symptom of pregnancy. An increase in hormones makes it hard to keep your skin clear of blemishes and breakouts because of the excess oil your body makes. Using a good natural facial cleanser is advisable because it allows you to remove dirt and bacteria from your face so that it’s clean and less likely to break out bad. Avoiding the things listed below helps prevent skin problems so that you look and feel your very best. ●	A surge of hormones. 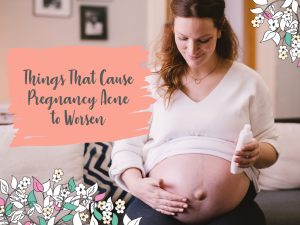 The first trimester is a tell-tale time for pregnancy acne. It’s when it is most prominent. There isn’t much you can do to control it, and treating it with over-the-counter skin care products comes with a risk because many contain chemicals that cause birth defects in babies. Pregnancy-safe skincare products are the only ones that should be used while carrying a child. ●	Stress. Worrying about every little thing can make a breakout even worse. Be mindful that there are things that are out of your control. You can, however, react a certain way to the unexpected things occurring around you. Doing so gives you a sense of control over your emotions and actions. Try deep breathing, writing in a journal or watching something that makes you laugh. Welcome distractions can keep you from stressing over things that are beyond your control. ●	A change in your skincare routine. If you haven’t been good about washing your face or sleep in your makeup, you may notice more instances of breakouts. Switching skincare products abruptly can cause problems, too. Keep this in mind before changing things abruptly. You can always consult your doctor for advice if your skin condition has worsened severely. ●	Using products that are not right for your skin. Every woman’s skin is different. If you use a product that is designed for sensitive skin when your problem is an overproduction of oil, you may cause your acne to worsen. Choose products that are safe to use while pregnant and ones that address your unique skin type. That way, you’re not erasing all the good you’re doing by having a regular skin care routine. If you’ve had acne in the past, you may notice that it came back once you got pregnant. Women who have had problems with their skin before pregnancy often have issues when they’re carrying a child. Drinking lots of water, changing your pillowcase often, and avoiding touching your face helps keep the acne from worsening. Prevent Future Breakouts by Using Products That Naturally Balance the Skin. Address pregnancy acne immediately with effective treatment options. You don’t need to suffer the consequences because of the increase in hormones in your body. With Pretty Mommies products, you’re able to take good care of yourself without causing further harm to the body’s largest organ, your skin. You’ll be fresh-faced and ready to embrace the day with confidence because all people will see is your pregnancy glow.